Asters can be challenging to learn. However, once you become familiar with the key identifying features of each species, they don't seem quite as hard to learn. I got a real kick-start learning Asters in the fall of 2004, during a Hamilton Naturalists Club walk with Dr. Jim Pringle of the Royal Botanical Gardens (Burlington, Ontario). There's no substitute for an expert identifying and pointing out the characteristics of each species. This is the best way to learn the Asters. One important thing to remember when dealing with Asters is that their common names vary widely, with even the same common name being used for different species! So you would be well advised to learn the scientific names of Asters as well. One tip I will give right now to those who are trying to learn Asters of Ontario. Do not use the Peterson's or Newcombe's field guides to try to learn these species! You will only end up very confused. Only a portion of the species featured in these guides actually occur in Ontario. See the Booklist page for recommended books about Asters in Ontario. #1. Here is a list of the common Asters that occur in Ontario. This is a beginner's list. Get to know all of the species on this list before moving on to list#2. #2. These are less common Asters in Ontario. You might tackle these as "step two" of learning Asters. #3. Here is a list of Aster species listed in the Peterson & Newcombe field guides which do NOT occur in Ontario, or are RARE or VERY RARE in Ontario. In other words, don't bother with these. Asters bloom in the late summer or fall. They have composite flowers, which means the flowers are composed of Ray flowers and Disc flowers. To the untrained eye, the Ray flowers appear to be "petals", whereas the Disc flowers appear to the the actual flower. This is, however, incorrect, The Ray flowers are actually flowers as well. The two flower types are shown in the following photo (New England Aster (Symphyotrichum novae-angliae)). 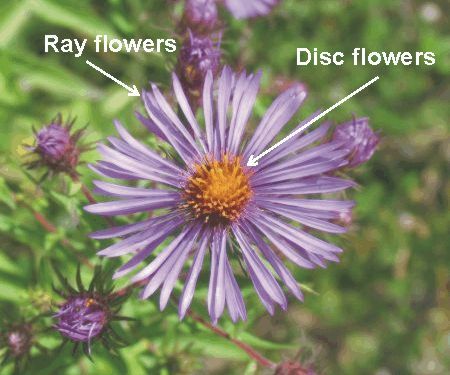 Many aster species have disc flowers that start out yellow, and gradually turn purple or brown as the flower ages. You will often find flowers with discs of both colours on the same plant. leaves: clasping the stem or not, size and shape, fuzzy or smooth. Note the differences between the basal leaves (at the bottom of the plant near the ground), middle stem leaves, and upper stem leaves. Asters can be confusing and challenging to identify because many of their features vary from plant to plant of the same species. For example, the stem of one specimen may be hairy, that of another smooth, yet they are the same species. Flower colours also vary, as does stem colour (as in Purple-stemmed Aster (Symphyotrichum puniceum)). Please see the Booklist for recommended books about Asters. The flower-heads comprise central disc flowers and peripheral ray flowers. There are no pales (bracts at the base of the individual flowers) on the receptacle, nor is the receptacle deeply pitted. The involucre comprises small (not foliose) bracts, which are multiseriate and imbricate (as contrasted, e.g. with those of Senecio, which are in one short and one long series). The disc flowers are bisexual. The lower part of the corolla is a slender tube. The upper part flares abruptly and is radially five-lobed. The stamens each have a triangular appendage at the apex, but no appendages at the base of the pollen sacs. The stigma comprises two slender branches, with the receptive zones along the edges. Each branch ends in a triangular appendage that bears the collecting projections on its abaxial surface. The pappus comprises numerous slender, flexible bristles, which are minutely barbed but not plumose (i.e., they're not branched like a feather). The cauline leaves are alternate.